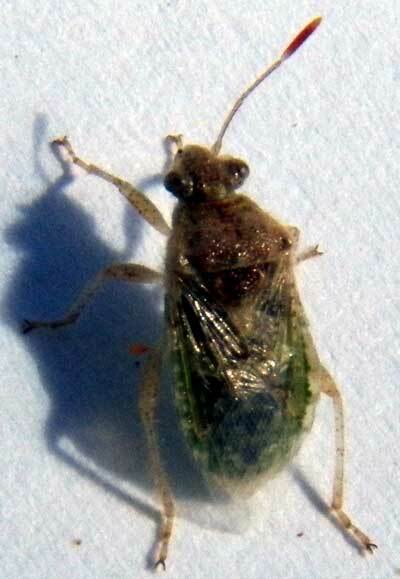 This adult scentless plant bug was found in the Harquahala Wilderness, La Paz Co., Arizona, USA. 11 March 2012. Length is about 4mm. Scentless Plant Bugs are belong to the true bug family, Rhopaldae. ‘True Bugs’ because entomologists restrict the term bug to a subset of all insects, whereas the lay public tend to lable all invertibrates as bugs. Many true bugs found upon plants are capable of emitting gaseous liquids that are pungent and sometimes irritating like birds and lizards. These are probably a deterent to insectivores. Rhopalids lack the glands and do not produce scents. The other feature that usually permits easy identification is the small club at the tips of the antennae. Copyright Michael J. Plagens, page created 9 January 2013.